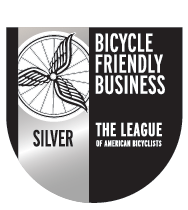 Today, the League of American Bicyclists recognized us with a Silver Level Bicycle Friendly Business (BFB) award, joining a group of more than 1,000 businesses from across the country. With the announcement of 100 new and renewing BFBs today, Specialized Real Estate Group joins a cutting-edge group of more than 1,050 local businesses, government agencies and Fortune 500 companies in 47 states and Washington, D.C., that are transforming the American workplace. Specialized employees take a quarterly tour of our properties by bike. We also participate in the National Bike Challenge, and provide bike safety and maintenance training along with incentives and prizes for participation. We’d love to see more businesses discover the joy of bicycling! To apply or learn more about the BFB program, visit the League online.